You might not be a gamelan expert. If you are, you're ahead of me, and you probably already know that most of the gamelan recordings widely available hail from the Indonesian island of Java, particularly the area of Jogjakarta. But the quaint, terraced and touristed (and infrequently terrorized) island of Bali has its own gamelan styles. 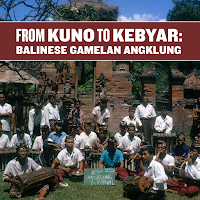 Recorded in the mid 1960s, the new release From Kuno to Kebyar: Balinese Gamelan Angklung is a marvelous look at this unique gamelan music. Extensive liner notes help set the stage culturally, geographically, historically, and religiously. The short story is that Bali was a separate nation until defeated by Javanese forces in 1343, though it remained (and remains) a Hindu holdout in an overwhelmingly Muslim nation. The gamelan angklung is a set of instruments specially tuned in pairs to produce ombak (resonant waves), and used extensively in religious ceremonies. This slightly-out-of-tune sound -- which apparently emerged before Muslim and Hindu influences -- can be a little tough on the unconditioned ear, and the newcomer to gamelan may not want to digest the full 73-minute CD at one sitting. Attentive listening does reveal wide differences in the sounds of the pieces, from the crisp 52-note melody of "Tujang Buro" to the frenzied clamor of "Godeg Miring," which is not unlike the raucous sound of Konono No. 1 though here the sound is completely acoustic. The recordings are clear and crisp, and if you didn't know this was 45-year-old "world music" you might mistake it for an avant-garde percussion ensemble. 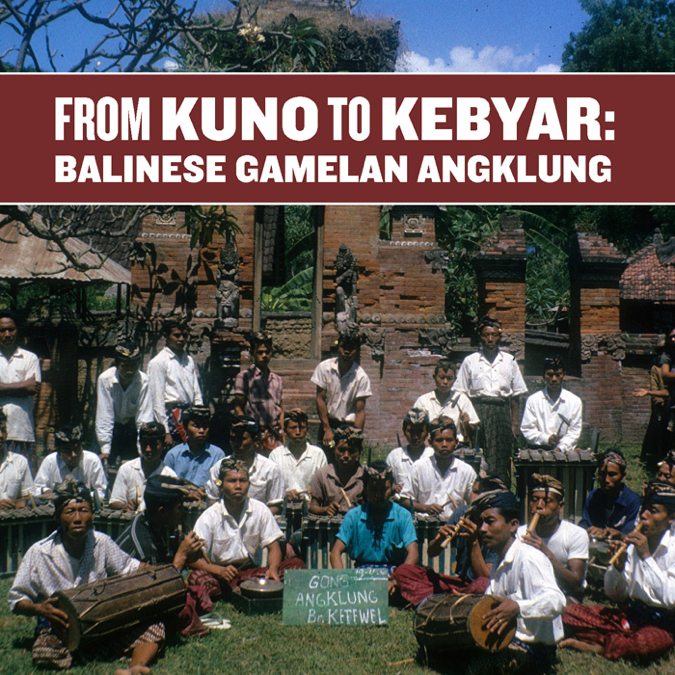 The notes suggest that one style of Balinese gamelan that emerged after the Dutch subjugation of the island "illustrates how the Balinese responded to outside pressures by creating a new music whose restless style was a musical reflection of the turbulent times." In other words, rock 'n roll. * Sort of. Smithsonian Folkways bills this album as "the first devoted exclusively to gamelan angklung", though I find in my collection another somewhat mysterious older release called Gamelan of Bali - Angklung Sidakarya. Ah, well, such mysteries are good for the soul, as this music is good for the culturally curious soul. Hear samples at the link below.